When you pull the drawstring from around a hood or along the bottom of a jacket too much, it can come out of the garment. This can happen when it's in the wash as well. Accidentally removing the drawstring is particularly frustrating because putting the string back is a fiddly job, but with a bit of patience and a safety pin you can replace the string. You can also use this technique to put a new drawstring in the jacket to replace an old, fraying one. Check that the safety pin fits through the hole where the string goes. Undo the safety pin and attach one end of the jacket's drawstring to the pin. Close the safety pin. Then lay the drawstring out flat on a surface. Position the jacket so the edge into which you want to thread the string lies flat against a surface. Face the hole upward. 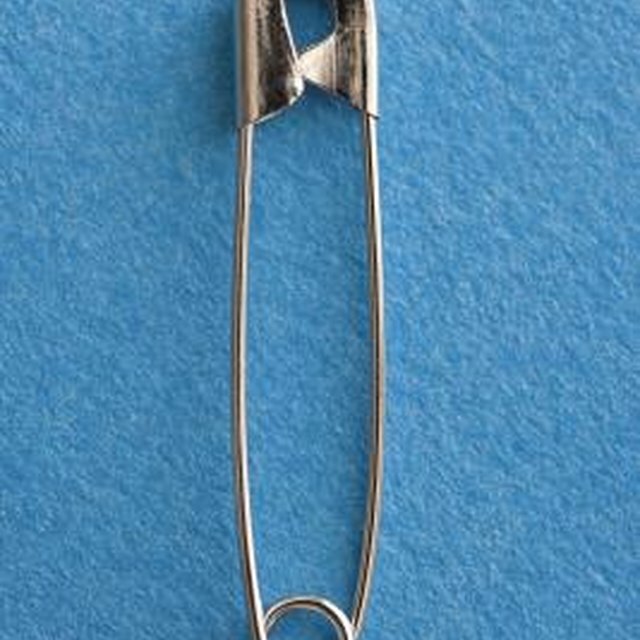 Insert the safety pin with the string attached through the hole. Then wiggle the safety pin through the fabric. Push it forward and then pull back the fabric along the drawstring, so that gradually the safety pin moves along within the seam. Continue pushing the safety pin through the tunnel of fabric, until it reaches the other hole. Pull the drawstring through until the two protruding ends are equal in length. Remove the safety pin from the string. Tie a knot in each end of the jacket's drawstring to prevent the string from coming out again.